Since 1972, Liquiflo has manufactured high-quality Gear Pumps and Centrifugal Pumps, specifically designed to meet the demanding needs of the chemical industry. Liquiflo pumps are made from high-alloy materials such as 316 Stainless Steel, Alloy-C, Alloy-20 and Titanium. By offering a large selection of corrosion-resistant internal materials and multiple sealing options - such as mechanical seals and magnetic-drives - Liquiflo pumps are capable of pumping a wide range of chemicals - including acids, caustics, solvents and polymers - over a wide range of conditions. Below is a brief summary of the Liquiflo gear pump range. For additional information please refer to the PDF links at the bottom of this page, or feel free to contact the staff at Process Pumps to assist you. The 2-Series Mag-Drive Gear Pumps were designed for low-flow applications. Their compact and rugged design makes them ideal for many applications, including chemical dosing and metering, pipeline sampling and wastewater treatment. The 4-Series Mag-Drive Gear Pumps were designed for OEM applications such as chemical feed systems. 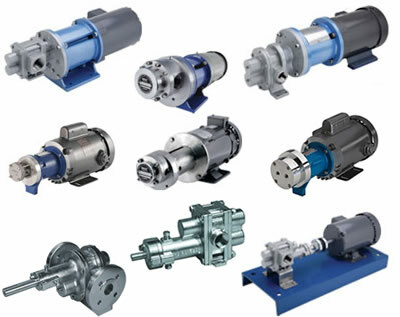 These pumps offer a large selection of materials to cover a wide variety of chemical processing applications. A unique feature of the 4-Series pump is its parallel port connections located on the front of the pump. The H-Series Gear Pumps were designed as an upgrade to Liquiflo’s original 3-Series. With similar outside dimensions and capacities, the H-Series incorporates larger diameter shafts and bearings, allowing them to handle higher pressures with extended service life. The H-Series pumps are available in 316 Stainless Steel or Alloy-C construction, and Sealed and Mag-drive versions with flows up to approximately 113 l/min and differential pressures up to 15.5bar with 20.5bar possible on some models. The Max-Series pumps feature helical gears and relieved wear plates for smoother and quieter operation and intrinsic reduction of gear separation forces. Their unique and durable design will assure extended life in high pressure pumping applications. The Max-Series pumps are available in Sealed and Mag-Drive versions with flows up to 75.7 l/min and differential pressures up to 24bar. The basic material of construction is 316 SS with Titanium available for select models. metal surfaces. Fluoro-Polymers exhibit the highest corrosion resistance of any plastics. This combination of stainless steel on the outside and Fluoro-Polymer on the inside gives the Poly-Guard™ the full strength and integrity of a metal pump with the ultimate corrosion resistance of a Fluoro-Polymer. Flow rates can reach up to 56.9 l/min while differential pressures can reach 7bar. One highly desirable feature of the Liquiflo pump philosophy is the ability to custom build pumps to suit special applications. If your application will not suit a standard pump build due to factors such as abrasive liquid characteristics, high temperatures, high/low viscosities then Liquiflo will use their many years of experience, combined with high technology materials to work out a pump solution that suits your application needs.